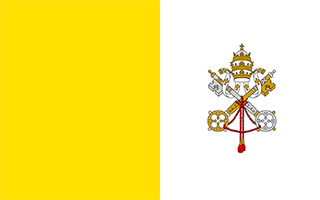 Vatican with its capital is located in Europe (Southern Europe, an enclave of Rome (Italy)). It covers some 1 square kilometers (about 0.7 times the size of the National Mall in Washington, DC) with a population of 1,000. Latin, Italian and French are the languages spoken by people in Vatican (consider regional differences). As an interesting fact, Italy is the only bordering country. Perhaps the Vatican needs no introduction. The center of Catholicism, and encompassing the Vatican City state, as well as the surrounding Roman neighborhoods of the Vaticano, Prati, and Monte Mario, this small slice of the city is packed with more history and artwork than most cities in the world. The two main entrances to Vatican City for tourists are A) the Vatican Museums, accessible from Viale Vaticano on the North side of the city state and B) St. Peter's Basilica, on the Southeast side of the city and accessible from Via della Conciliazione. While guidebooks do their best to provide an aid for viewing the collections inside the Vatican, a guided tour is a far better way to make sure you get the most out of your visit. The topography is urban with low hill. The average density of population is about 2,273 per km². The climate in Vatican can be described as temperate with mild, rainy winters (September to May) with hot, dry summers (May to September). Potential natural disasters are occasional earthquakes. To reach someone Vatican dial +379 prior to a number. The local cellular networks are operated on 900 MHz, 1800 MHz, 3G, 4G. Websites typically end with the top level domain ".va". If you want to bring electric appliances (e.g. battery chaarger), keep in min the local 230 V - 50 Hz (plugs: C, F, L). The sign for the locally used currency Euro is EUR.